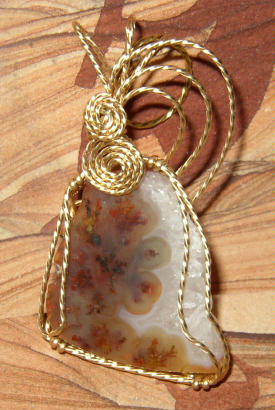 Wire wrapped/sculpted pendant made from a gold and black free-form Plume Agate from the Woodward Ranch in the Texas Big Bend area and 14 K Gold-Fill Wire. 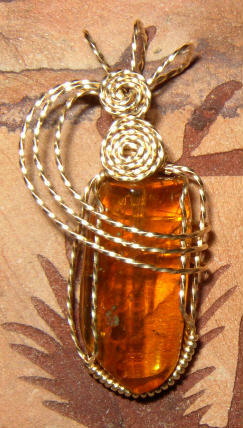 The approximate dimensions are : 1 " W X 2 " H X 1/2 " D. and includes a cord. 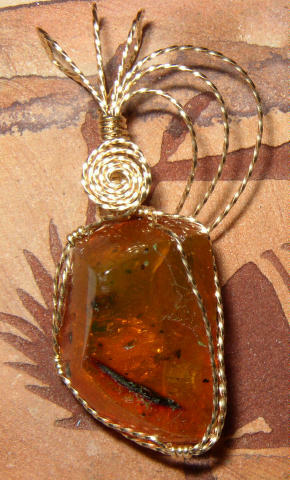 Wire wrapped/sculpted pendant made from a gold and red free-form Moss Agate from the Woodward Ranch in the Texas Big Bend area and 14 K Gold-Fill Wire. 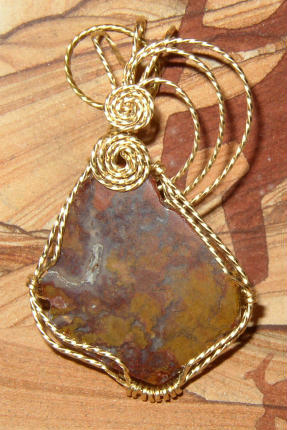 The approximate dimensions are : 1 " W X 2 " H X 1/2 " D. and includes a cord. 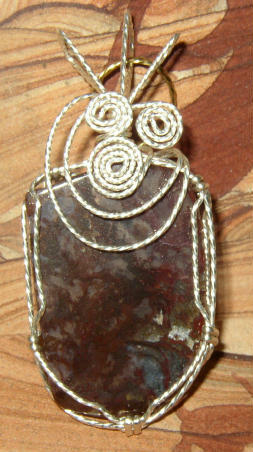 Wire wrapped/sculpted pendant made from a Maroon free-form Moss Agate from the Woodward Ranch in the Texas Big Bend area and Sterling Silver Wire. 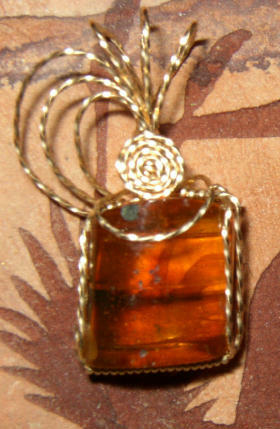 The approximate dimensions are : 1 " W X 2 1/4" H X 1/2 " D. and includes a cord. 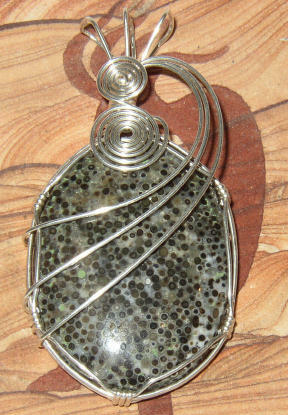 Wire wrapped/sculpted pendant made from a polished 30 X 40 mm cabochon of fossilized Oolite from New Mexico and Sterling Silver Wire. 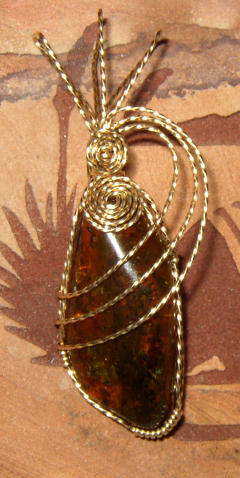 The approximate dimensions are : 1 " W X 2 1/4" H X 1/2 " D. and includes a cord. 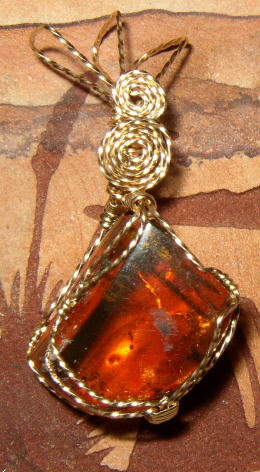 Wire wrapped/sculpted pendant made from polished Dominican Republic Amber embedded with fossilized insects (10-30 MYO) and 14 K Gold-Fill Wire. The approximate dimensions are : 1 1/4 " W X 2 " H X 1/2 " D. and includes a cord. 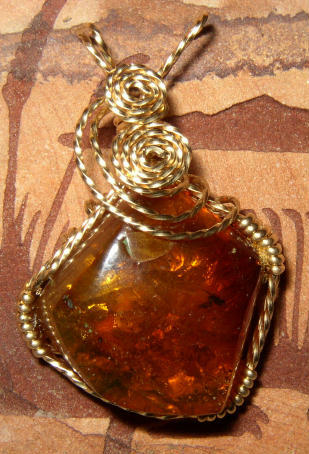 Wire wrapped/sculpted pendant made from polished Dominican Republic Amber embedded with fossilized insects (10-30 MYO) and 14 K Gold-Fill Wire. 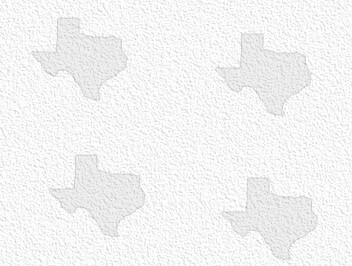 The approximate dimensions are : 3/4 " W X 1 1/4 " H X 1/2 " D. and includes a cord. 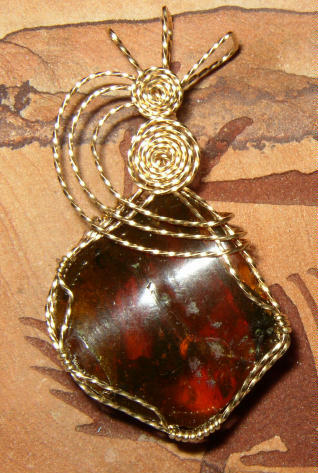 Wire wrapped/sculpted pendant made from polished Blackstone and Iron Pyrite (Fool's Gold) and 14 K Gold-Fill Wire. The approximate dimensions are : 1 " W X 3 1/2 " H X 1/2 " D. and includes a cord.